On May 4, 2018, NCLEJ and co-counsel at Virginia & Ambinder filed a lawsuit in New York state court against the New York Department of Labor (DOL) on behalf of the Chinese Staff and Workers Association (CSWA), National Mobilization Against Sweatshops (NMASS), and a number of individuals who are employed as home care aides who work 24-hour shifts in New York. Many home health care agencies require their employees to work 24 hour shifts, but only pay them for 13 hours of work. Home health aides are largely women of color and immigrants—two groups who are already vulnerable to receiving pay far lower than they deserve. Last year, the DOL issued emergency regulations that legitimize this unfair practice. The lawsuit challenges these regulations. The emergency regulations violate New York State’s Minimum Wage Act, which exists specifically to ensure that everyone in New York receives sufficient pay for their work. Additionally, by issuing emergency regulations, the DOL deprived workers and the public of the opportunity to make their voices heard regarding the impact of allowing employers to pay workers so little. 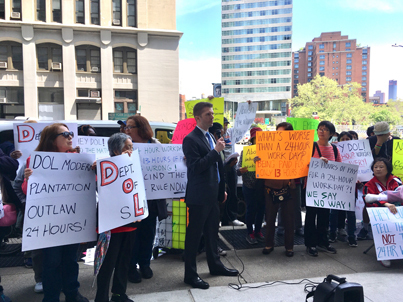 On May 9, 2018, Senior Attorney Travis England and Staff Attorney Katie Deabler joined NMASS, CSWA, and attorneys from Virginia & Ambinder at a press conference and demonstration at the DOL’s Manhattan office, and called on the DOL to abandon this exploitative and unfair policy. NCLEJ attorneys for the plaintiffs are Travis England, Leah Lotto, and Katie Deabler. For further information contact Travis England, england@nclej.org.